This French video was on the market very early (since 1996). The author Michel Dujay demonstrates how to throw knives of all kinds (especially pocket knives) in a way that they stick in the target. He prefers to use a blade grip and uses it even on the handle! The throwing movement is explained only briefly but demonstrated with background music quite a few times (the video was originally made to be broadcasted on TV). Fundamental things like the posture of the body and how to correct the distance to the target are explained very comprehensible. Also interesting is his target out of wood blocks and the lesson about traditions where you learn never to accept a knife as a present without giving a return present. The duration of the video is 30 minutes, the language is French. The tape is in the format VHS-SECAM, that is any normal European video recorder can show it, but only in black and white. 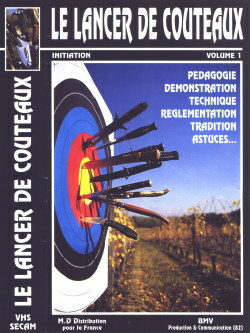 The video is sold in many weapon stores in Paris but can also be obtained directly from the author. Update: More than 20 years later, Michel Dujay produced an completely new and improved version of the video, which also includes 3D animations in the explanations. Read our review of the DVD.